Port City is growing up; Congratulations on 1! I've made no bones about my bias towards Port City Brewing. It is pretty cool to have your local brewery practically right around the corner from your house. The folks that work there are very pleasant and cool. Yesterday, to celebrate their one year anniversary, they released a single batch of stout. Here was the catch, it was incredibly limited to restaurants and establishments around the DC metro and northern Virginia region. At 6 pm last evening there was a simultaneous release across the region. Jim Dorsch, the beer buyer for Whole Foods in Alexandria and all around good guy, was manning the keg and filled two growlers with the good stuff. Dan and I talked a bit about the anniversary stout while recording episode five of the podcast last night, but frankly this beer deserves its own write up and you will see it this coming Wednesday. I will say this though, if Port City continues to brew beer of this quality then they have a long and bright future ahead of them. I'm really looking forward to what they will do this coming year. This leads me to my other point that I wanted to make. Lately I have been playing around with Kickstarter, and it is a pretty cool site. I was originally lead to it when Joe Ellis, an up and coming singer was using it to fund his next project. (Joe also happens to be the kid brother of my best friend through grade school, and because I really like seeing people from my hometown do awesome in the world I encourage you to check out his music.) The next thing I know I was typing in brewery in the search engine and a whole bunch of projects jumped up. for success for this brewery. If you have the time check out a few of them. If you feel like donating even better. 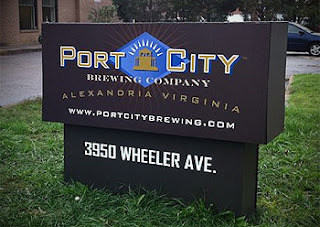 Since trying Port City beers I have been impressed with their brews. I am going to have to make a trip to the brewer soon. The way you talk about anniversary stout I hate that I missed that one, or is there still some in supply at whole foods? If you come to the Super Bowl party tomorrow I'll be bringing the other growler with the anniversary stout. Skye I have to back you 100% on port city anniversary brew. That was an awesome stout that I wish port city would brew year round. Great super bowl party and what I left with was the earning for more port city stout.